I LOVE Thrift Stores! I always have and I always will. 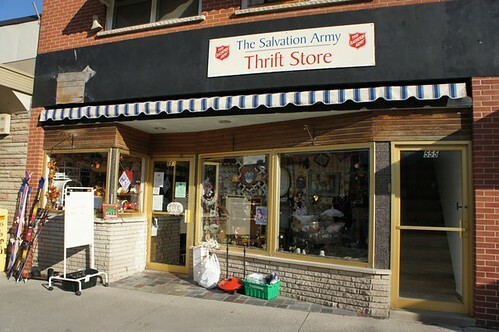 When I was a teenager, my cousin Emily and I would often catch a bus to Salvation Army and spend hours shopping. Armed with my allowance ($20), I could come back with a gigantic bag filled with clothes that actually fit and still have money left over. Phillip, our nephew Riley, and I went thrift store shopping today. The 3 of us crammed into the tiny pickup truck we’re currently borrowing and headed to the nearest Salvation Army. Almost immediately, we found some good deals. I found 3 full decks of cards for 29 cents each. Shortly after that, Phillip sent Riley to find me because they had found something they KNEW I’d love – a vintage Kenmore sewing machine for $20! In addition to the sewing machine, we also found a working Sears typewriter for $5, an office chair for $3 and got THREE bags full of clothing for around $9. We also bought Riley a Gorillaz CD for $1 and 2 really nice trench coats for 35 cents each (no, that’s NOT a typo!). I am extremely happy with today’s thrift store haul. Hopefully we can make this a weekly thing. I know Phillip might not like it but I sure would! Thanks for the information about your Kenmore Deluxe Rotary sewing machine. I did not know that White was the manufacturer of Kenmore machines. I have a box of Deluxe Zig Zag cams. I understood they were Kenmore, so I thought I’d research to see if the name of the machine they go to is Deluxe. All the best to you! Hmm, hadn’t thought of going to Salvation Army to look for a good working typewriter!! Have been wanting one for a while, may have to take a short road trip this weekend to downtown Ashland!! Thanks for the idea! We like going to the equivelant of a thrift store – especially since we discovered that they deliver furniture for a price, it still works out cheaper than new.